Stir with ice, strain into a cocktail glass, and garnish with an orange twist and a cherry. In my search to find enough Meletti recipes to make the purchase worthwhile, one recipe that kept popping up in Redbook and other sites was the Mother of Exiles by Nick Bennett. Nick crafted this tribute to a 1880s poem that helped raise money for the Statue of Liberty at Porchlight in New York City. That poem was the sonnet "The New Colossus" by Emma Lazarus; while the lines "Give me your tired, your poor,/Your huddled masses yearning to breathe free,/The wretched refuse of your teeming shore" became infamous, the previous stanza declared, "A mighty woman with a torch, whose flame/Is the imprisoned lightning, and her name/MOTHER OF EXILES. From her beacon-hand/Glows world-wide welcome". Perhaps the combination of ingredients here represents the Scottish, Irish, Italian, and Spanish settlers in this country (Scottish and Irish settled in Pennsylvania and were the driving force behind rye whiskey distillation). 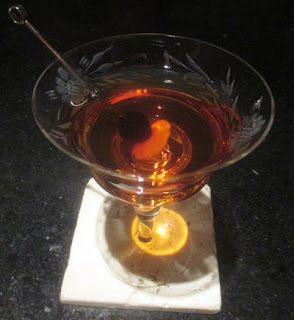 A similar assemblage was crafted by Brother Cleve in his Union Cocktail to represent the immigrants to Somerville, MA, with Irish whiskey and Meletti Amaro being overlapping ingredients. The Mother of Exiles greeted the nose with orange, caramel, vanilla, and floral aromas. Next, the amaro's caramel continued on into the sip, and the swallow followed things up with rye, softer Irish whiskey notes, nutty, violet, and bitter herbal flavors.